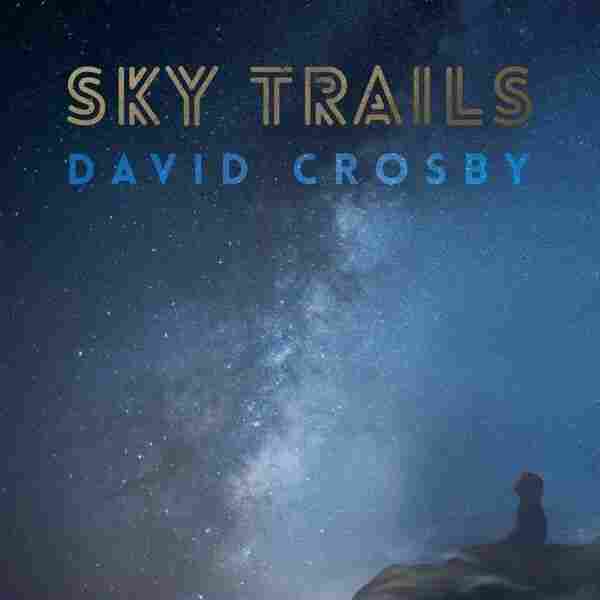 Stream David Crosby's New Album, 'Sky Trails' The folk-rock forefather unleashes his inner jazzbo on his sixth solo album. Where Lighthouse was a sparse, acoustic-oriented recording, produced by Snarky Puppy's Michael League and harking back to Crosby's Laurel Canyon heyday, Sky Trails (overseen by Crosby's keyboard-playing son, James Raymond) sports some sophisticated, jazzy arrangements. Jazz has been a major influence on Crosby throughout his career, but this is the first time he's incorporated it into his work so overtly. Recalling his youthful initiation into the jazz cabal, Crosby explains, "My older brother turned me on to '50s jazz — Dave Brubeck, Chet Baker, Gerry Mulligan, that period. And of course once you start listening to that stuff, all roads lead to [John] Coltrane and Miles [Davis]." The inspiration made its mark on every phase of Crosby's work, from The Byrds' "I See You" to Crosby, Stills, Nash & Young's "Déjà Vu." " I do like complex music," he allows, "I like intricate chord changes and really subtle words. It's why I started retuning the guitar and working in open tunings all the time." From Sky Trails' first track, the Steely Dan-ish "She's Got To Be Somewhere," it's clear that Crosby's embracing his inner jazzbo more than ever. "It sounds like Donald [Fagen] and them should have done it," Crosby readily admits of the tune, with its juicy electric piano chords, tart sax lines, and complex harmonies. " My favorite band in our end of things has always been Steely Dan, and that's largely because they feel the same way [about jazz] as me." Another major touchstone here is the jazziest era of Joni Mitchell's music, when she was playing alongside the likes of bass deity Jaco Pastorius, sax hero Wayne Shorter, and guitar virtuoso Larry Carlton on '70s albums Hejira and Don Juan's Reckless Daughter. Not only does Crosby deliver a luminescent, piano-based cover of Hejira's "Amelia," the arrangements of songs like "Before Tomorrow Falls on Love" and "Here It's Almost Sunset" bear fretless lines from Estonian bass phenom Mai Agan that seem to conjure up the ghost of Jaco, especially when countered by sax man Steve Tavaglione. Crosby comes by his Joni obsession honestly, though. They've been tight since the late '60s, when he produced her first album, and the only time Mitchell ever composed with one of her peers was on the Crosby-co-written "Yvette In English." "Joni's a huge influence on me," he confesses. "If you're a singer-songwriter and you've heard the record <i>Blue</i>, for the rest of your life that's where the bar is. She's better than I am and always has been, but we do like a lot of the same stuff. You'll hear things in our writing that are similar." Crosby, who is notorious for his candid Twitter comments, recently posted a plea to all songwriters to come up with the definitive anti-Trump anthem. But the closest the perennially political Crosby says he could come up with himself for Sky Trails is the Congress-bashing "Capitol." The sinuous but outspoken song seems to pick up where Crosby's 1971 solo cut "What Are Their Names" left off. "We have the worst congress we've ever had," says Crosby unreservedly. "They are bought, paid for, and they behave abysmally. I couldn't resist writing as critical a song as I could manage about them. 'What Are Their Names' is talking about how the corporations own and run America, 'cause they own Congress. That's not a democracy, that's a corporatocracy. 'Capitol' is in the same spirit, but it's aimed specifically at Congress." Crosby even finds a way to sort of cover himself, on "Somebody Home." He performed a live version of the song with Snarky Puppy for the neo-fusion collective's 2016 album, Family Dinner Volume Two. But the band joins him on Sky Trails for a studio take that captures the same hushed, fragile magic as the live recording. Crosby's a huge fan of the band, declaring, "If they needed a singer I'd volunteer," he says wryly, "but they don't." Just as it was back in the heyday of CSNY, collaboration remains key for Crosby. It's a crucial component of Sky Trails, whether its his interaction with Snarky Puppy, his co-write with Michael McDonald on "Before Tomorrow Falls On Love," or his close partnership with James Raymond, whose production, keyboards and co-writing help define the album. "It's as if you were a painter," he avers, "and you had a palate that had seven colors on it. If you worked with somebody else, suddenly you've got 14 colors and it makes a better painting."